Themes ranged from Mughal, Rajputana, to British, Maratha and Tribal. Draped in their colourful apparels and surrounded by spruced up décor, each member of our personnel looked very much the part of an ancient clan they represented. The ambiance that had been created was not only in sync with their given guise but also brought back reminisce of a bygone era. It’s definitely a pleasure to see that every team displayed their creative and fierce competitive spirit with a positive attitude. 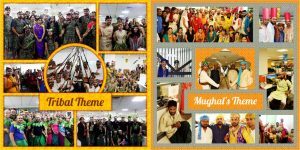 The competition was finally won by the Tribal and Mughal team for their liveliness and managing to bring out the true essence of teamwork. It was our 70th Independence Day this 15th of August, 2016 that we at Xento were honoured to celebrate. Spreading the euphoria of freedom and to radiate the spark of patriotism all our employees were adorned in hues of saffron, white and green. Most of us are aware that the colour saffron stands for strength and courage, white for peace and green for growth and prosperity. These valuable traits are something that we Xentians not just treasure but also practice them. It was definitely a fascinating sight to see our Xento staff in tricolours of the Indian flag. August is the month for celebrations and it just keeps getting bigger and better. The celebration was followed by Xalt- Xento Annual Loud Triumph a corporate event that was one-of-a-kind and a fun-filled rendezvous. To catch a sneak-peek of this event do visit our facebook page.